The Sungrow 1500 volt project (image courtesy of Sungrow). 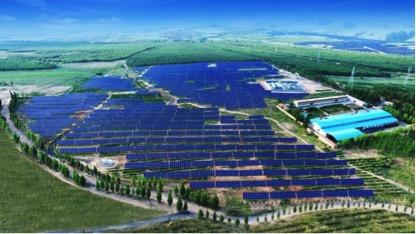 The power plant has been developed by Sungrow in Datong, Shangxi Province, China, and is currently the largest 1500 volt solar power plant in China. The plant uses Sungrow’s SG3000HV-MV medium volt inverter container, which is a class-leading product with a maximum efficiency of over 99%. This inverter is designed to be the leader for the 1500 volt market with unit power reaching up to 3MW. With a specially engineered container design, the SG3000HV-MV is able to save installation time and reduce labor costs. The 20-foot container can bring a number of benefits including the ability to lower system costs and ease of operations maintenance over the long term life of the product. The SG3000HV-MV has received a positive reception from experts in the solar industry and is expected to be the leading choice for the solar power plants employing 1500 volt inverters for the next several years. According to the company, the one-stop solution employed in this 50MW project is designed to enable the building of high-efficiency, high-reliability and highly intelligent solar power plants. It is also able to continuously enhance system performance based on the “Solar+Internet” model, claims Sungrow. This solution is capable of building a standard O&M platform and promoting automation of the power plant through the real-time monitoring, fault alarm and big data analysis.